*Note: This turkey skillet mac and cheese first appeared on February 7, 2012 (originally titled “Grown Up Hamburger Helper Mac ‘n Cheese”). The recipe has been edited slightly and the pictures updated. I still stand by my stance on abandoning the sketchy ingredient list ridden Hamburger Helper box and making this easy, 30 minute one-pot meal instead. It’s every bit as tasty (if not more so!) and way better for you. Post now includes 4 other one-skillet/pot meals from some of my blogging friends too! 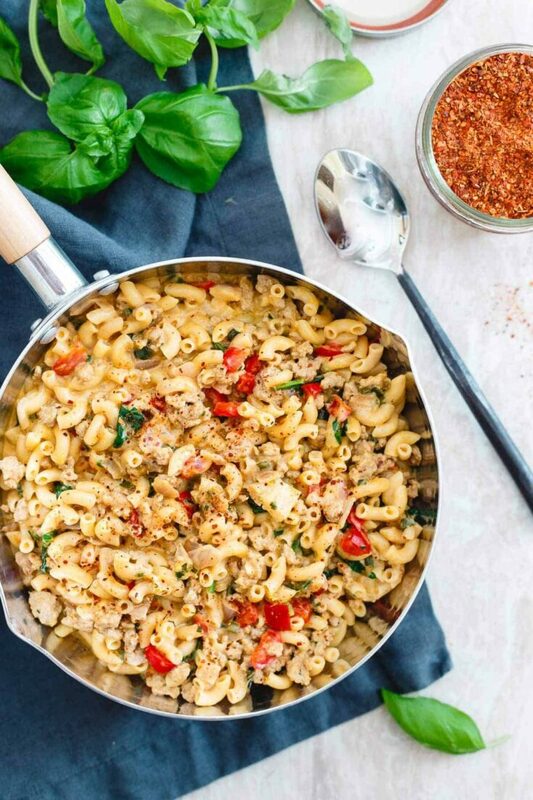 This one-pot turkey skillet mac and cheese is like a grownup version of hamburger helper and a much healthier option than that boxed stuff. Filled with spinach, peppers, real cheddar cheese, on the table in just 30 minutes and easily made gluten-free too! Remember Hamburger Helper and that weird white hand with the red clown nose who bounced around countertops (he totally freaked me out)? This is what I’m calling the grownup version. Granted, we never actually had that as kids (along with many other kid friendly/preservative filled foods we were deprived of) but this at least tastes like what I’d expect Hamburger Helper to except with the addition of peppers, spinach & lean turkey. And minus probably 95% of the ingredients you see here. That’s kind of sickening isn’t it? And what’s up with the imitation bacon bits, Betty? Go big or go home when it comes to the good stuff! 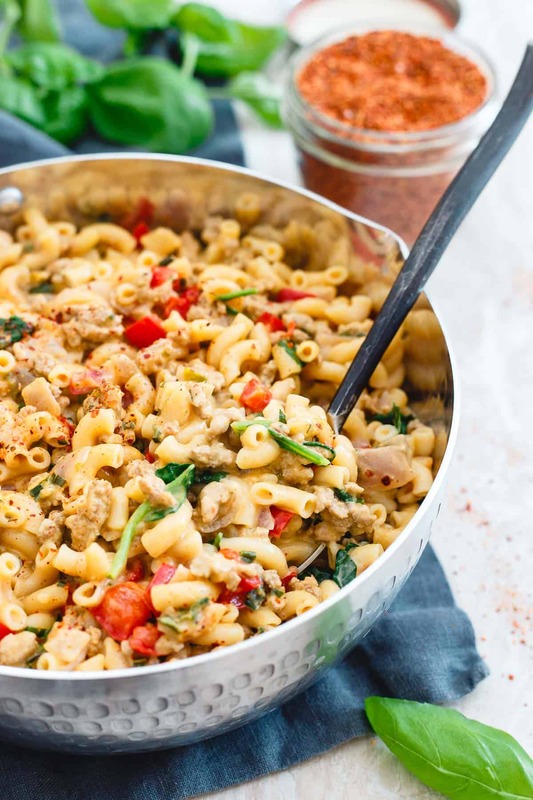 Before we get into this turkey skillet mac and cheese though, check out these other delicious and healthy one skillet meals! Ok, back to the turkey skillet mac and cheese! This is total, complete, utter, 100%, to the max (insert any other descriptor you can think of here) comfort food, that just happens to be pretty healthy too (kinda like this creamy Greek yogurt mac ‘n cheese with peas and bacon). It’s sit in front of the TV, put your sweats on (I do that a lot if you haven’t noticed), curl up on the couch with a cozy blanket kind of food. This is food that will win you bonus points with your significant other (especially if they’re mac and cheese fanatics like mine) and definitely have them doing the dishes afterwards while you sit and relax. In my infinite wisdom, I made this on a night Ulysses wasn’t home though, so I didn’t even get that luxury. Poor planning on my part. I usually get really annoyed by mac and cheese recipes out there that have me making rouxes, using multiple pots, dirty whisks all over the place, starting on the stove top, moving to the oven… It’s all just way too complicated for freakin mac and cheese, you know? I want one pot, cornstarch exists for a reason and don’t make me decide which of my 5 different whisks I need to use. Problem solved. 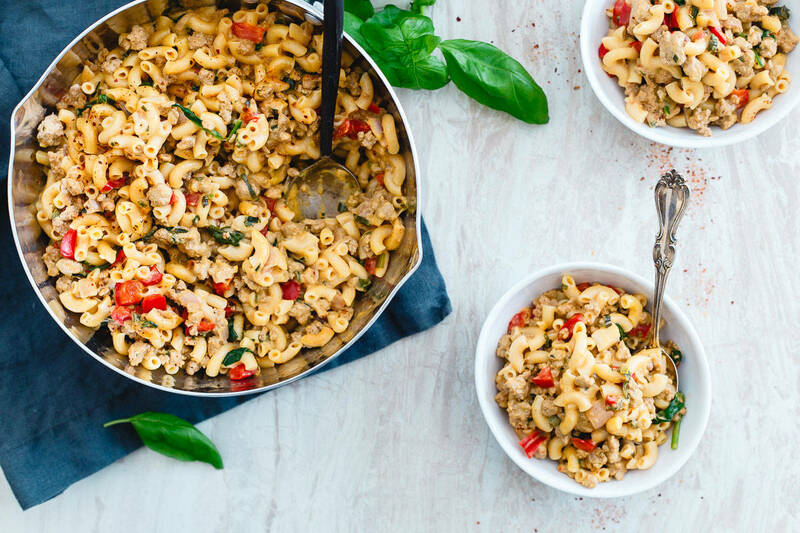 This turkey skillet mac and cheese fits all those requirements and still tastes like you spent hours in a dirty pot filled kitchen with flour and whisks strewn about. 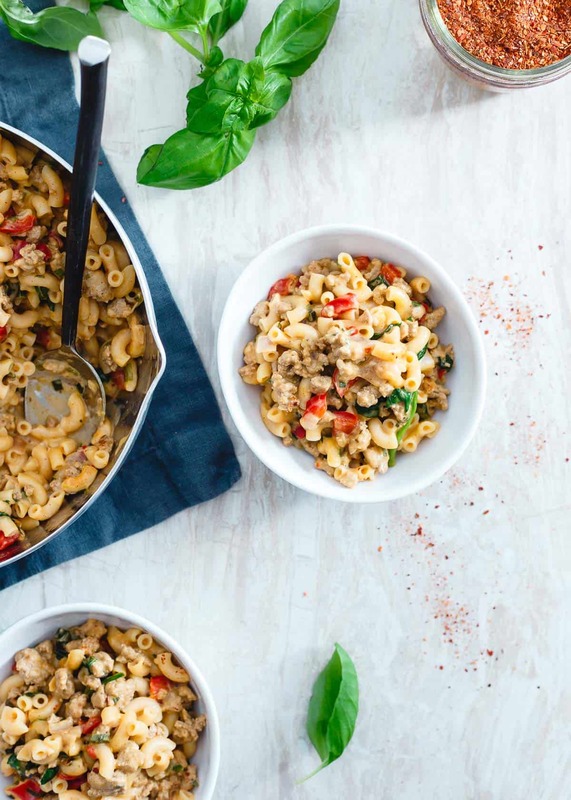 This one-pot turkey skillet mac and cheese is like a grownup version of hamburger helper and a much healthier option than that boxed stuff. Place olive oil in a large pot over medium-high heat. Once hot, add turkey and cook until browned, breaking up with a spatula as it cooks. Drain excess liquid from the pot and return to the stove. Add the onions and cook with the turkey until softened, about 2-3 minutes. Add the garlic to the pot and cook an additional minute until fragrant. Add the peppers to the pot and cook another 3 minutes until slightly softened. Add cornstarch and spices and stir until the meat mixture is thoroughly coated. Add the milk, water and pasta, bring to a boil then reduce to a medium simmer, cover and cook for about 10 minutes, stirring a couple of times while cooking. Uncover the pot, turn off the heat, add the spinach and cheese and stir until spinach is wilted and cheese is melted. Adjust seasonings to taste and serve. I love this idea and I bet it makes good leftovers – you know, so you can still impress the hubs. Looks lovely and wholesome! I used to work in a quality assurance job where we compared ingredients of different products against one another; the longest list I remember was over 200 ingredients in a frozen Jimmy Dean’s breakfast sandwich. Ugh. that is just downright scary! I just found this recipe on Pinterest and had to check it out. It almost sounds too good to be true :) I’m going to try it this week! i think I pin every one of your recipes. Seriously. Looks so good! I actually kinda love making roux. Does that make me weird? Probs. This looks ahhhhhhh ma zing. Looks good to me! Hamburger Helper was a staple in my home growing up. Though I haven’t had it in many years, I do kind of miss it sometimes. Now this is Hamburger Helper to new heights. Refresh my memory, what lens are you shooting with? I know you changed your file saving methods, but is this a 50mm f/1.8 or a zoom or what? I think you shoot on a Rebel, right? Your images are so sharp and clear! If you do anything for your evening/dinner hour photography to help with lighting, I’m all ears. I’m trying to cook & show more dinnertime food but the lighting is so atrocious I bail on the idea most times! I just shoot with the stock lens that came with it (EF-S 18-55mm f/3.5-5.6 IS Type II Lens) right now. I would love a macro soon though! Yep thats gonna get made over here too. I’m so glad I found your blog, you have solved all my dinner woes. :) I even have all of these ingredients! MIRACLE! Love this! Homemade hamburger helped type meals have been fairly frequent around here lately. It’s something I can guarantee that everyone will like and you can change the flavors to whatever you want! Who needs a box especially when it has that ingredients list on it? Haha. This looks great, I love that you mixed in spinach – I love adding it to so many different meals, it’s so easy and no one ever notices the taste even if they don’t usually like spinach. That is like a dream in a pot… all you need in a meal! You should adopt my approach to roux. I make a huge batch then put most of it in the fridge. Then when I need it I just spoon some into the pan and call it a day. It keeps forever. Its especially handy for dark roux since they take so long to cook. I had no idea you could store roux like that and it would keep. That’s a great idea! I would love to take credit for the idea (oh wait I did), but I actually learned it from a chef when I was in culinary school. Mmm I think I can get used to this Hamburger Helper!! Growing up I hated the packaged kind that my friends parents would serve….my mom never made anything out of a box, so I wasn’t’ used to it, she would make something like yours and my friends would be “weirded” out! LOL! sounds like my house as a kid too. We always had the “weird” healthy food. No white bread, the horror! LOVE that last photo! 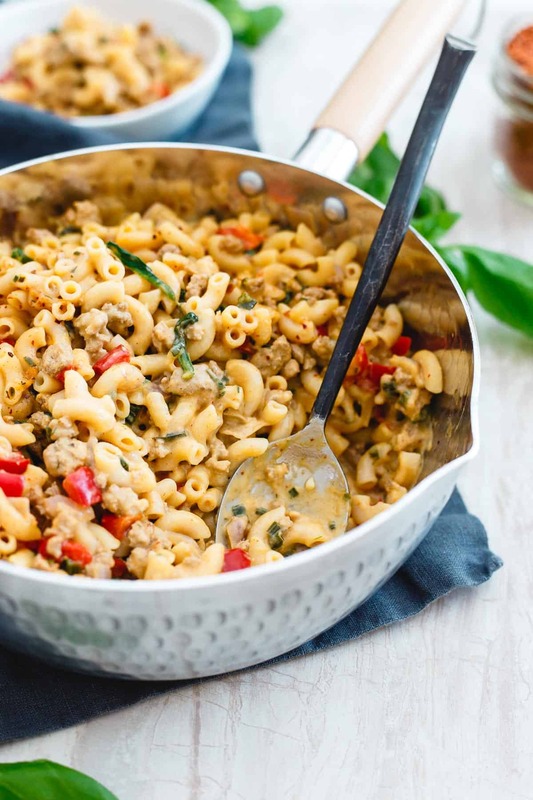 This looks so incredibly delicious….and I never even liked the kid version of hamburger helper! Meat, vegetables, pasta, cheese, and glorious seasonings? Who needs Hamburger Helpers? Help ourselves to this is what I say! That is a seriously scary list of ingredients. But your dish looks amazing! Yummy list of ingredients!…yours, not the other one, lol. I will make anything with ground turkey. So easy! Wow! This sounds amazing! Seriously. We were never allowed hamburger helper as kids except for maybe once in a blue moon. Funny, I used to want white bread SO badly as a kid. And now I will only eat the honey whole wheat bread I grew up on! Think our parents were on to something? Mac and cheese is always a kid-friendly dish…It is nice to have an exclusive, all grown up version every once in a while. Thanks for the post! I love this dish! Oh my! That ingredients list is ridiculous. 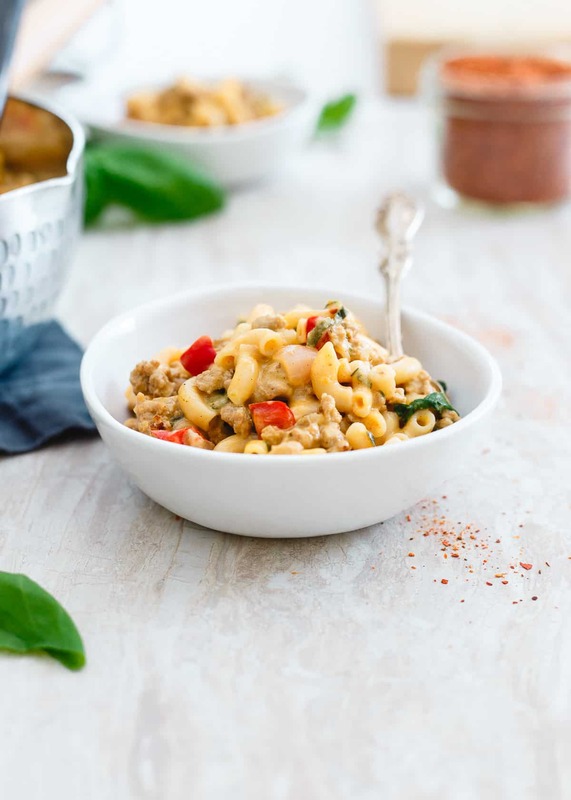 I can’t say I’ve ever eaten hamburger helper (I’ve been a vegetarian/vegan for as long as I can remember) but your healthified version looks delicious! I’m definitely going to attempt a vegan version- possibly with tempeh in place of the turkey? This looks amazing! When I was a kid my Mom mmade Hamburger Helper once! We both got sick from it, I’ll never touch the stuff again! Yuck!!! My HUsband asked to buy it about two months ago, and I’m like ewww! No way in hell!! I was told unexpectedly that I needed to look at this post and then make this for dinner by my husband. Hahaha! This just made my night. Made this tonight. Didn’t change a thing. Everyone loved it including the 6 year old and the 22 month old. Delicious! So glad you all liked it! I am used to boiling noodles separate….can you please clarify? Do you just add the dry noodles into the turkey veggie mix plus the milk and water and let the noodles cook that way? Sorry for the stupid question, just want to make sure it turns out right. Ooops, didn’t mean to leave that comment link??? Sorry about that. Yep, just add the dry pasta to the mix, it will cook with everything else in there, it absorbs all the liquid. Hope you like it! I love this recipe! Smoked paprika is a hit! Added a little salt, perfect. that’s awesome, so glad everyone liked it! totally gonna make this cause i bet it’s 10x better than what i grew up on! the box version. GENIUS my friend! SO much better than the boxed stuff! In love with this healthier version and can’t wait to make it for dinner! My mom used to make hamburger helper for us all the time. This looks so much better!! This literally sounds SO amazing!!!! Made this last night & it was DELISH. My very, very picky fiancé went back for seconds. The only thing we did differently was add extra red pepper flakes. Will make again! Just made this and it is great. I didn’t have the red bell pepper but everything else. Used extra sharp cheese. Love this dish !